You still have 4 days to place your order for one of our Valentine’s Day “cakes for two.” These heart-shaped cakes and tarts are available in many of our most popular flavors, including fruit tarts, chocolate ganache, creme brulee tarts, our award-winning Renaissance cake and many more. Call us at (914) 472-0702 to place your order. When you pick up your cake, don’t forget to ask about our heart-shaped cookies, Valentine’s cupcakes, freshly dipped semi-sweet and white chocolate-covered strawberries or our hand-made gourmet truffles. They all make great gifts! Heart-shaped cakes and chocolate-covered strawberries will be available for pick-up on Saturday, February 13, 8am – 6pm, and Sunday, February 14, 8am – 1pm. The full menu is available for download here. 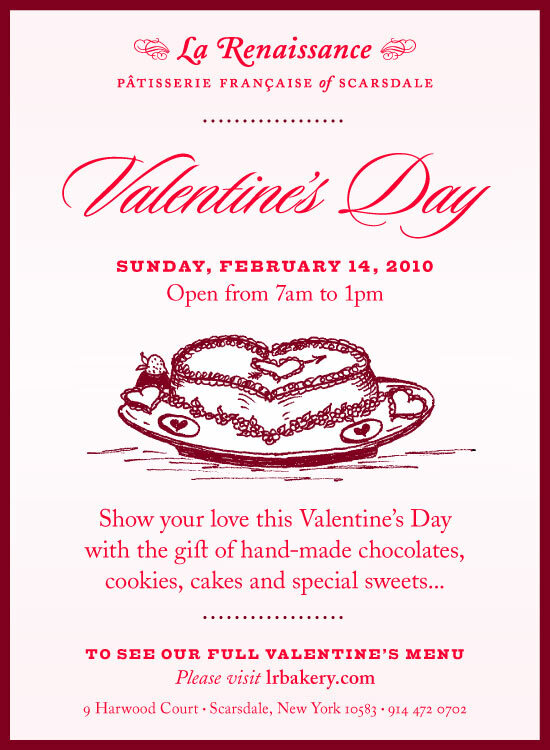 Valentines cookies, cupcakes and hand-dipped truffles are available everyday until February 14.